Without a penalty for driving without a license plate, it is not clear whether police officers or courts would have the authority to impose a punishment on drivers who choose not to display license plates or registration stickers, especially in jurisdictions that still use red light cameras. Driving with a false or altered plate remains a misdemeanor, however. Lawmakers will not have a chance to remedy their mistake until January 8, 2013 when the legislature reconvenes, unless Governor Perry calls a special session specifically to address the license plate issue. 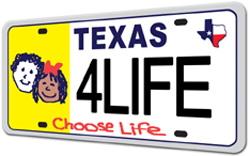 Motorists in Texas now have the opportunity to purchase Choose Life license plates, the sales of which will benefit efforts to help women find abortion alternatives and promote adoption. Talk about an "Oops..." moment! I wonder who first recognized that little unintended consequence. It would be nice to see Texas get rid of the front license plate requirement.